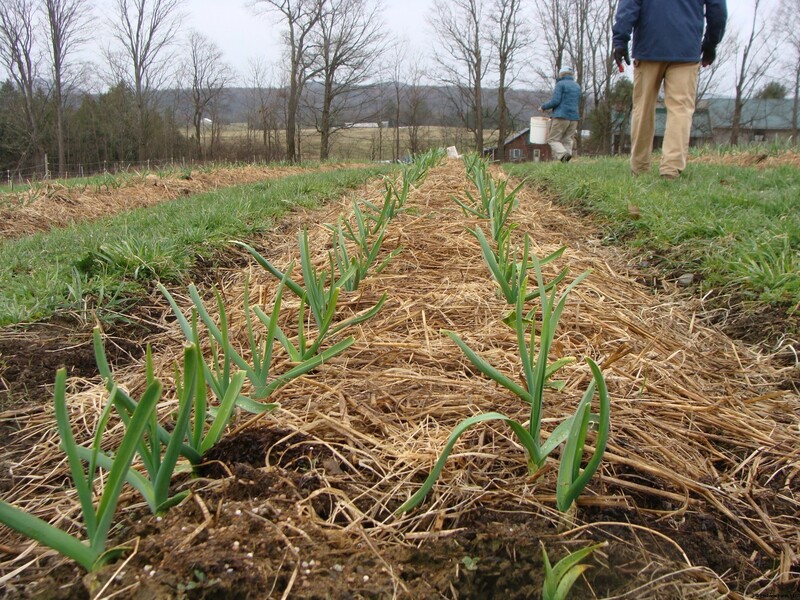 In the middle of April or early in the month of May garlic tips begin to poke their noses out of the straw mulch covering the beds in our south field. It’s always a welcome sight in the spring. Some years it snows here right through May. Others years it may become hot then cold then hot again. This past year 2015-2016 has been a winter of record warmth with very little snow covering. Spring has been variable. We have had some lovely warm days then more typical weather arrives. It can be very cold and windy and even if the sun is shining it still feels wintery. We expect it to happen after living in this place for over 25 years. 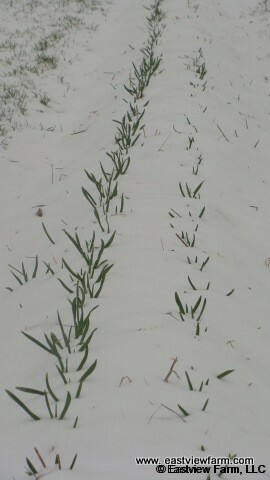 There is a storm today bringing light fluffy big snowflakes that have accumulated to a few inches of white on the rows of shoots. It will be great “poor man’s fertilizer” for the garlic. 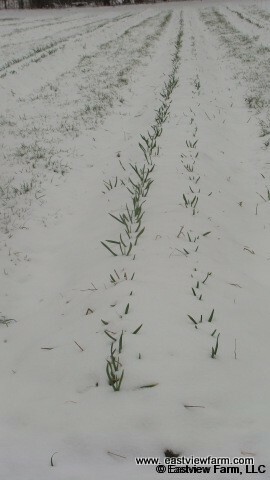 The garlic doesn’t seem to mind a little snow. It’s one of the reasons why it’s a good crop to grow on Eastview Farm; anything finicky doesn’t last long on this small farm. It dies or is choked out by weeds or pasture grass. 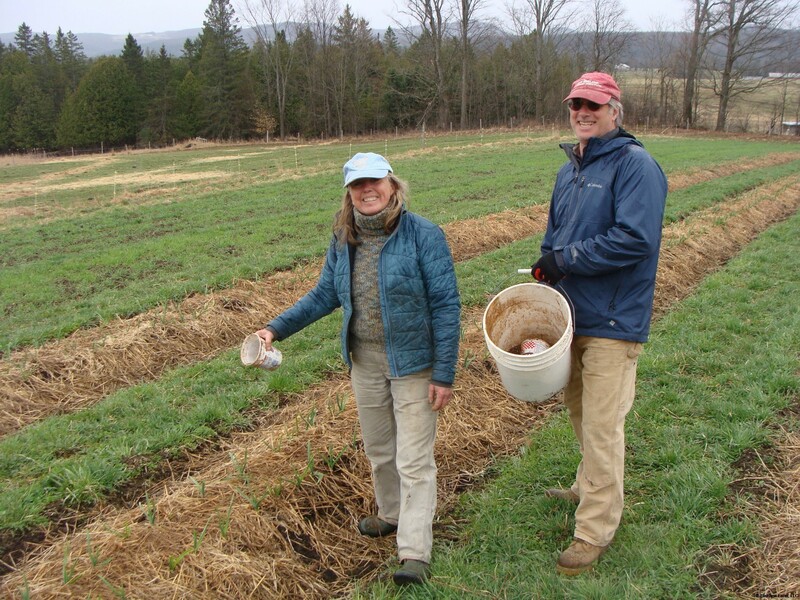 The days begin to lengthen and the urge to plant in the field grows stronger but the soils outside are not quite warm or dry enough to work or they are still freezing and thawing on alternate days so most plants or seeds have to wait to be planted into the open ground in the field for a little bit longer. 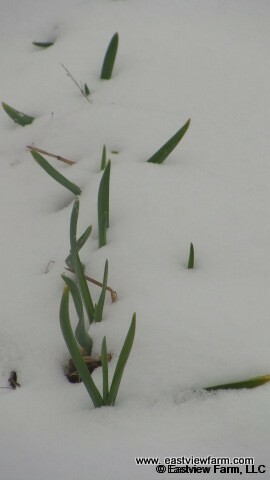 The garlic gets a head start. 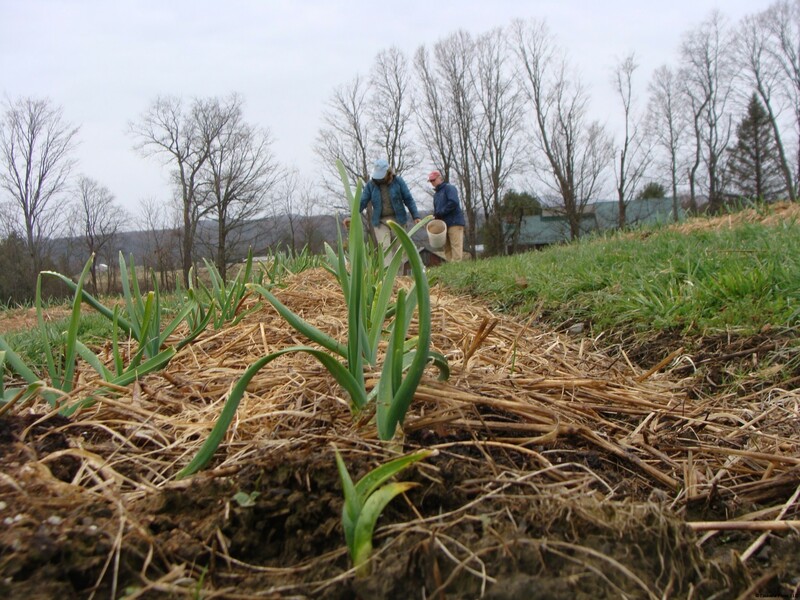 Our garlic is scheduled to get a scattering of North Country Organic Pro Grow which is an all – purpose fertilizer. It’s on our tentative farm calendar for the week of April 18th or April 25th with a second feeding scheduled for May 16th or May 23rd. We put this first fertilizer feeding down sometime between April and May depending on the depth of the snow in the field. 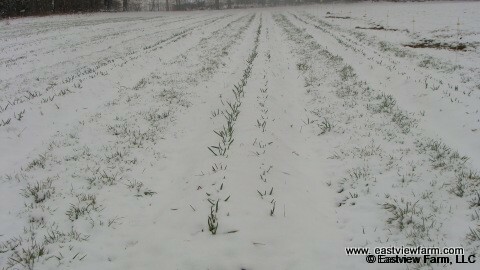 We do not pull the straw away from the emerging plants. We let the leaves grow a little more slowly and cautiously with the covering in place just like we wait to put away the winter sweaters, coats, gloves, and hats. It helps on days like today to have a layer of warmth. This amazing plant greets me with green just when I need the boost. It is almost like fertilizer for me! Happy Spring from Eastview Farm! 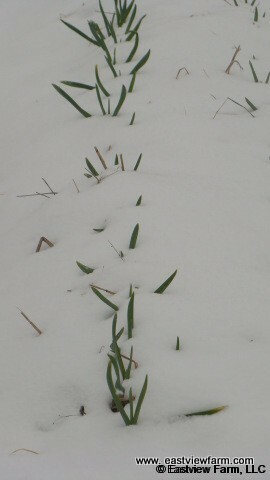 In April the garlic poked up through the snow.